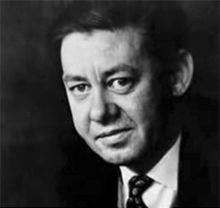 Peter Bryan George (24 March 1924 – 1 June 1966) was a British author, most famous for the 1958 Cold War thriller novel Red Alert, also known as Two Hours to Doom, written under the pen name Peter Bryant. The book was the inspiration for Stanley Kubrick's classic film Dr. Strangelove or: How I Learned to Stop Worrying and Love the Bomb. Peter was nominated for both Bafta and Oscar for his part int eh screenplays. He was born in Treorchy, Wales, and died in Hastings, East Sussex by suicide. He was a Flight Lieutenant and navigator in the Royal Air Force during World War II, where he was involved in a plane crash that nearly resulted in his death. Despite this he reenlisted in 1951. Deeply committed to disarmament and haunted by the prospects of a nuclear war he fatally shot himself in the mouth in 1966. His best-known novel, Red Alert was written while a serving RAF officer, (hence the original use of a pseudonym: Peter Bryant – the Bryan being taken from his middle name). Drawn from personal experience, Red Alert was the inspiration for Stanley Kubrick's classic film Dr. Strangelove or: How I Learned to Stop Worrying and Love the Bomb. Due to interest in nuclear themes sparked by Stanley Kramer's film version of On the Beach in 1959, the film rights to Red Alert were sold that year, only to be handed around until Stanley Kubrick bought them in 1962, reportedly for as little as $3,500. Peter George co-wrote the screenplay for the film with Kubrick and Terry Southern, but wasn't completely satisfied with the overall satirical feel of the movie. After the film was released, he wrote a novelisation of Dr. Strangelove and dedicated it to Kubrick. George later wrote another novel to denounce the use of nuclear weapons, entitled Commander-1. He died in 1966 when he was working on his next novel, Nuclear Survivors. In 1958 Cool Murder was copyrighted. This was translated into German (with the title Die verschwundenen Perlen – the disappeared pearls) by Magdalena Sobez and published by Wilhelm Goldmann Verlag, München. The back cover says that at age 11 he enrolled at an English International School. Die verschwundenen Perlen is a Mike Hammer type detective story set in Pacific City (Los Angeles) in the 1950s. Come Blonde, Came Murder (T. V. Boardman, 1952) as "Peter George"
Pattern of Death (T. V. Boardman, 1954) as "Peter George"
Cool Murder (T. V. Boardman, 1958) as "Peter George"; later reissued in paperback (Mayflower, 1965) as "Bryan Peters"
The Hong Kong Kill (T. V. Boardman, 1958) as "Bryan Peters"
The Big H (T. V. Boardman, 1961) as "Bryan Peters"
The Final Steal (T. V. Boardman, 1962) as "Peter George"
Commander-1 (Heinemann, 1965) as "Peter George"